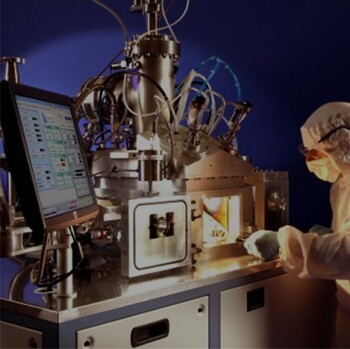 Surrey NanoSystems began as a start-up in late 2006, staffed by scientists from the University of Surrey’s Advanced Technology Institute (ATI) and CEVP Ltd - a leader in plasma thin film deposition tool manufacture - largely for scientific applications. Surrey NanoSystems' initial goal was the development of commercial systems for producing nanomaterials at low temperatures. The company's initial financial backer was the IP Group PLC. The first development project was the creation of a range of nanomaterial growth platforms known as NanoGrowth. This work - and the focus on producing materials to support the continued scaling of semiconductor devices - led to an evolution in the capability of the deposition tool dubbed NanoGrowth Catalyst. In parallel with the development of the deposition tool, the company's scientists researched nanomaterials to support specific semiconductor applications (the replacement of copper interconnects and more advanced dielectric materials for inter-layer insulation). A key foundation for this work was solving the challenge of growing nanomaterials at temperatures compatible with commercial semiconductor processes - work that resulted in a unique low temperature carbon nanotube and nanomaterial process. In 2012, Surrey NanoSystems' low temperature nanomaterial growth capability led to a project partnership to develop super-black coatings to enhance the performance of sensitive electro-optical imaging systems in a satellite application. This partnership with NPL and ABSL Space Products resulted in the creation of Vantablack - Vertically Aligned Nanotube Array BLACK - an array of carbon nanotubes with remarkable properties for trapping light. In conjunction with other properties including robustness against shock and low outgassing, the material has proven ideal for space applications, and the first satellite containing Vantablack was launched in December 2015. The unique low reflectance property of Vantablack has since led to numerous other applications in sensors, stray light reduction systems and also aesthetic applications - to enhance the appearance of luxury goods and artworks. The growth potential of the super-black coating market has become a major focus for Surrey NanoSystems.